While most weddings happen during the summer, a winter wedding can be incredibly romantic and cost effective. A winter wedding theme can have elements of Christmas but doesn’t necessarily have to be green or red and reindeer decor. 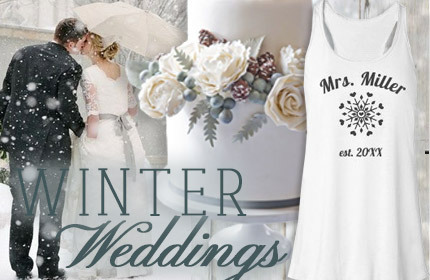 You can take a different route to make your winter wedding elegant and glamorous. 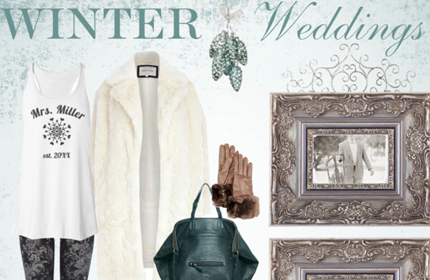 To help inspire you for your upcoming wedding, Bridal Party Tee’s has put together a winter wedding inspiration board! Decor for a winter wedding is all about integrating nature. Pine, pine cones, snowflakes, and berries are just to name a few. All of these ideas can be extremely cost effective versus using fresh flowers and also a great DIY project. One of the most important details that can be overlooked is taking advantage of the beautiful snow scenery. Use the snow as your backdrop for pictures and even as prop. Place his and your wedding bands in the snow or even write your names and date in the snow for a great detailed picture that you’ll remember forever. One of the best accessories to a winter wedding is the attire. Scarves, mittens, boots – you name it. Have all your bridesmaids wear matching boots or matching custom scarves during the ceremony. This idea could also double up as your gifts to your maids. Or even better, design something just for you like a custom mrs. sweater to celebrate your last name while getting ready for the big day. Accessories make winter weddings so unique because they can be used as intimate details that you simply cannot get in the summer. What are some great ideas that you have seen incorporated in winter weddings? As newlyweds the first Christmas married together is one to commemorate. You want a gift that is memorable and meaningful that perfectly says “you mean the world to me.” While some gifts can be practical, the first Christmas together can set a tone to remember for years to come. Bridal Party Tee’s has put together a list of first Christmas Married gifts to help inspire your holiday shopping. A popular option is a unique Christmas ornament. You can hang it every year on your tree and reminisce about the earlier years of your marriage. An ornament can either purchased from a destination that has meaning to you and your significant other or you can create a custom first Christmas ornament to include personalized information. Our custom Christmas ornaments allow you to add names, dates, and even upload images or pictures. How cute would it be to design a custom ornament with your wedding or honeymoon pictures? Another great option is matching couples gifts. 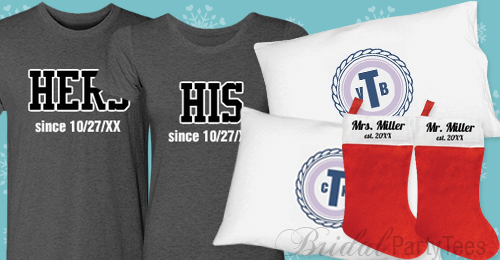 Bridal Party Tee’s offers custom mugs, stockings, pillowcases, pajamas, shirts, and sweaters that can be personalized and styled to your desire. We’ve already added designs to our gallery to but the options to customize can be endless. You can be simple by just adding your last name and anniversary date or you could be creative with inside names or jokes that are meaningful to you both. Last but not least, the Mrs. will love showing off her new last name with a custom mrs sweater or some wifey apparel. This route is very classy and timeless that she will love wearing for years to come. If you are having difficultly finding and designing exactly what you want let us know! We would be more than happy help you achieve the perfect gift for your first Christmas together. 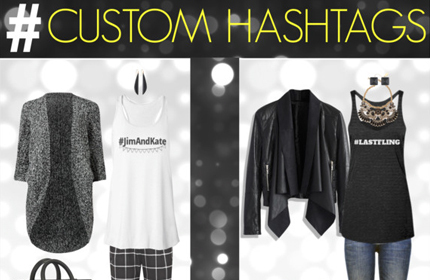 Looking for custom apparel for your bachelorette party or your big wedding day? She Said Tees is a one stop shop for all your custom bridal apparel needs. Bride & Co, Trophy Wife – you name it! 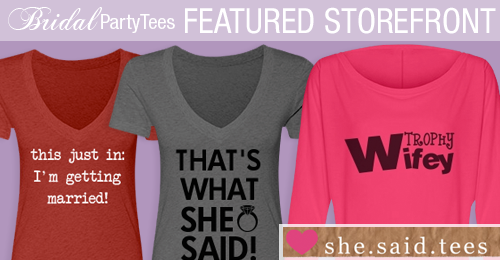 She Said Tees offers trendy wedding sayings on fashionable apparel. Have a saying or slogan in mind but you don’t see it on the site? You can take any design and make it your own by changing the art, font, and text. Our easy to use design center allows the customer to be their own designer and be as creative as they want. The option is up to you to make your designs cute, funny, or traditional. You will be sure to make your bachelorette party or wedding extra memorable with custom apparel! Do you see an opportunity with custom bridal apparel? 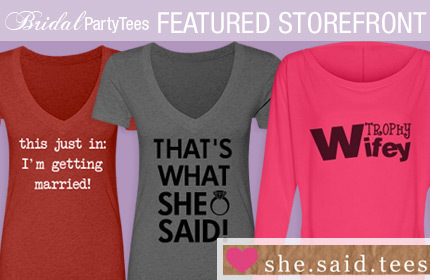 Check out Bridal Party Tees Storefronts and learn how you share your creativity with the bridal community!